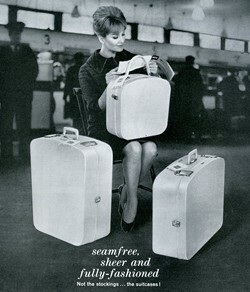 In the 1950s and 1960s Revelation was a high-end luggage manufacturer and a competitor to Antler. The company started in 1923. Revelation pioneered expandable luggage in the 1920s. In the 1930s it launched the Rev-Robe - a wardrobe case. In the 1950s Revelation was in the forefront of luggage technology. It intoduced new models with Fibreglass reinforced sides in the 1950s and moulded plastic cases in the 1960s. Revelation updated the Rev-Robe cases to new styles. There were different Rev-Robes for ladies and gents. In 1964 the Green Shield Stamp catalogue listed the Revelation Silverline Rev-Robe case alongside Longines watches, Parker 51 pens, the Kenwood Chef, Christian Dior 'Miss Dior' perfume, Wedgewood china and a Mappin & Webb canteen of cutlery as the 'finest in the land'. In the 1950s and 1960s 'gay' meant bright or cheerful. Bright colours were fashionable in the 1950s and early 1960s, but by the mid-sixties Revelation introduced sober shades, such as grey. Earlier cases also had the Revelation logo of a man carrying a suitcase on the locks. 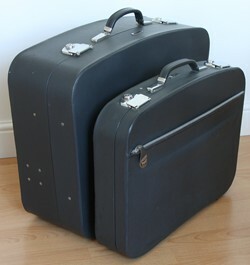 Revelation added a cabin bag to their Superlight range in the 1960s. The cabin bag had a sticker showing BEA approved it for cabin luggage. Unlike today, cabin bags went under the seat. The overhead racks were for coats and hats. Superlight was a soft case with hard sides. Sheerline was moulded from a material called Royalite. Royalite is a trademark for a type of ABS (acrylonitrile butadiene styrene). It can be moulded into rigid, yet flexible shapes; ideal for a suitcase. The Sheerline suitcases cost from £8 8s. A Rev-Robe in this material cost £11 19s 6d. In today's money these prices are £116 and £165 respectively. Revelation did not fare well in the 1970s. The factory closed in 1973. Antler subsequently bought the Revelation brand.